As Andrea is traveling with her parents in Nevada / Arizona / Utah, seeing all the great National Parks there I was alone for the weekend and did short (about 4 hours overall, including breakfast at Alice's Restaurant) trip in the area. A while ago I ordered Winglets from the R1200GS Adventure to install on my bike. My R1200GS is the 2010 standard GS model which means it has a smaller windshield than the Adventure and no Winglets which reflect wind that comes around the low sides of the windshield. 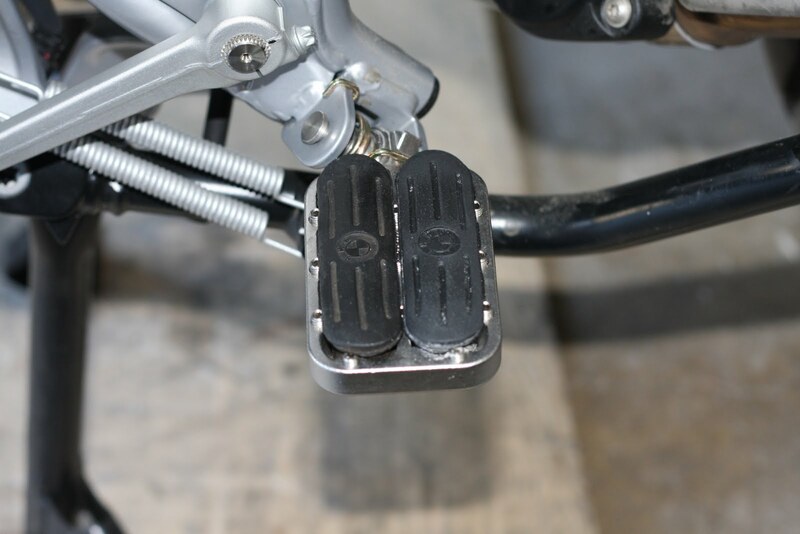 These are original rubber inserts from R1200GS foot pegs. They fit right in the Fastway as if they were made for each other. The right one in that picture is slightly greasy - I just got it from SJ BMW and it was sitting on their shelf for ages, therefore I got them with a good discount and to be honest: I put my feet there, rain or shine, so it doesn't really matter whether they are a bit dirty or not, they'll get some serious kicking anyways. 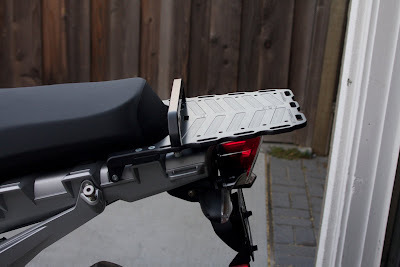 Today I received the MC Products luggage rack that I got used through ADVRider.com. It's an incredibly well made piece of aluminum! Black anodized with precision drilled mounting holes and attachment points for luggage straps all around. I found it interesting that the final drive oil was changed and I plan to do this again at 6k miles on my own if it isn't included in the service. Also interesting that they checked the fault memory twice, maybe just to make sure nothing got messed up during the service. So, I took more photos to compare the original pegs with the Fastway pegs in the low position. What I should have done is use a tripod with a camera installed, all in the same position and take a "before" and "after" shot. Today I installed a set of Fastway F3 footpegs. My goal was (and still is) to maximize the distance from seat to peg to create a very comfortable riding position. So, I thought I'd do the tank bag first but happened to stumble over a used tail rack on ADVRider. I was looking at this one just a day ago to solve my immediate needs for some storage on the bike. 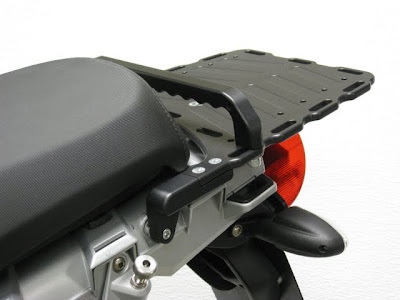 It's an MCP Parts Low Mount Luggage Rack. 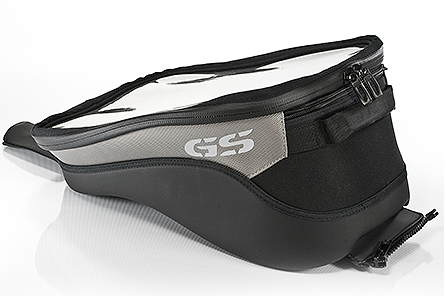 Today I checked out the BMW tank bags for the R1200GS. They are quite big, mainly wide. I don't think that I want such a large bag. It looks like they could fit an A4 sized sheet of paper in there. That's neither what I need nor what I want. I'd like to get a place to put the wallet, the phone, ear plugs, and some other small pieces and that's about it. Since I had the bike in for the 600 mile service the gas mileage (according to the onboard computer) is way down. I had around 46 mpg before and on trips with Andrea on her own bike I was around 48 to 49mpg. Today we went for a ride again and I had a hard time getting it to 43mpg. I will monitor that for at least a tank or two but will also check with SJ BMW whether the service included anything that might affect gas mileage. And no, I wasn't riding faster, if anything I was slower and more careful with Andrea in the tow. Over time I've looked at quite some luggage options for the R1200GS. There are lots and lots out there, all with different advantages and disadvantages. Here is my collection. Today I did my first ride after the throttle body sync during the 600 mile service yesterday. I rode home yesterday of course, but it was too short to get an impression. Today I took the slightly longer way home (15 miles instead of 4 miles) and it was pretty obvious that it is much better now. Less vibrations, runs smoother. Vibrations between 3k and 4k rpm are pretty much gone now, only there under load. So far I'm now really happy with the bike. As I also don't get headaches anymore when doing highway runs, I can also go touring now. I only tried a 1 hour run two days ago as I very much prefer to stay off the highway but I really wanted to know. And this is good now too. I'm still using the OEM windshield and get some wind right against the helmet at visor level which is not optimal for noise, to be honest it is really loud! I'm always using ear plugs, so it's not a real problem but still ... I have Adventure Winglets on order at SJ BMW and will see how much they do with regard to wind noise as lots of the noise seems to come from air coming around the bottom of the windshield. Still, I'm not unhappy with the standard screen, so as long as I'm not planning long tours that is okay. For long tours it's just nicer to have less noise plus a communication system to talk to my lovely wife! If we plan something like this or if I start riding longer tours, I'll probably get a Givi Airflow and be done with it. One thing I learned is a windshield needs to be adjustable. Everything else just plain doesn't work. The little thing that bothered my on the F800GS was that I could not lock the steering with the handle bar turned in to the right side. When I get off the bike I was used to turn the handle bar to the right, so I have lots of space. Couldn't do that on the F as this couldn't be locked in that position. So I left it straight, put it on the side stand, got off, turned the handle bar to the left, locked. To get on, reverse this procedure. On my Hondas I was able to just turn the handle bar to the right and be good with it. The R1200GS now has that feature again to be able to lock steering on both sides. Nice little difference, but it really should be available on the F, too. 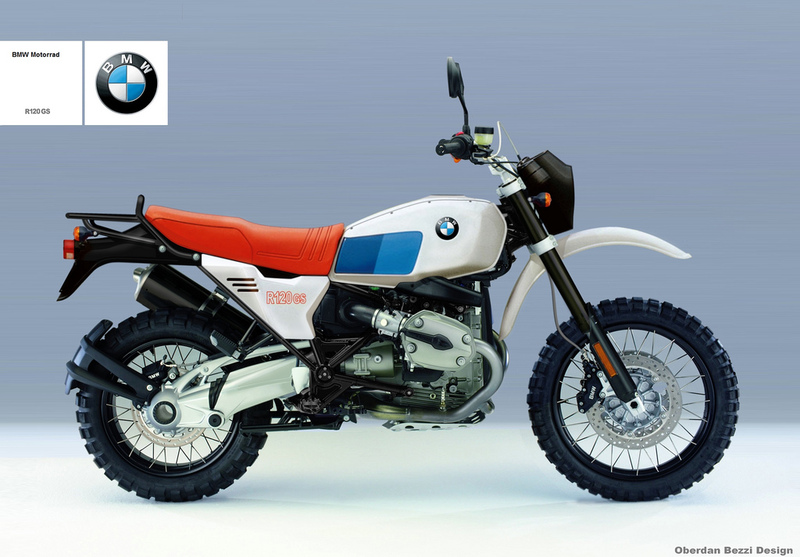 This is - in my opinion - an absolutely awesome mockup combining the original R80GS looks with modern elements from the R1200GS. Would love to see such a beast. It would probably be in direct competition with a Triumph Scrambler and the like. BMW would of course have to make some trade offs to come at least a bit closer to the Scrambler price tag, but still. It will never happen - but it would be awesome. While looking for an easier way to manage the blog just for the R1200GS, I'm trying now blogger.com as a blog provider. I'll transfer some of the blog posts over here and will see how it looks like and then decide whether to keep it or not.